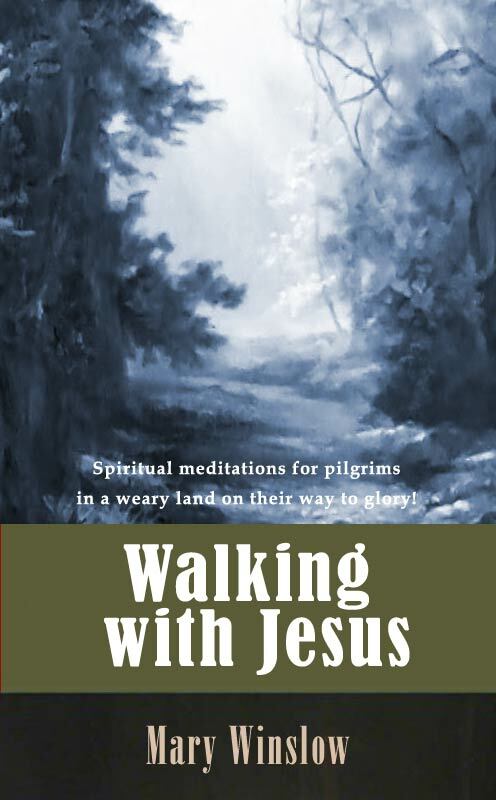 Spiritual meditations for pilgrims in a weary land on their way to glory! How often one word, a simple sentence, when applied by the Holy Spirit, gives comfort, and lifts one up! How much we need these helps all through our weary pilgrimage! We are such forgetful creatures; too often forgetting what we are, and what a God He is. How poor and unsatisfying are all things here below; even the best and the loveliest! Oh, to walk more intimately with Him, to live above the world, and hold the creature with a looser hand, taking God's Word as our guiding light; our unfailing spring of comfort. God has eternally provided such a magnificent and holy heaven for us above, that He is jealous lest we should set our hearts too fondly and closely upon the attractions of earth. Therefore it is that He withers our gourds and breaks our cisterns; only to dislodge us here, and lead us to seek those things which are above, where Christ our treasure is. Let us keep our eye and our hearts upon our blessed home. Earth is but a stage erected as our passage to the place Jesus has gone to prepare for us. What a place must that be which infinite power and love has engaged to provide! Oh, let us not lose sight of heaven for a moment. How prone are we to allow our minds and hearts (treacherous hearts!) to become entangled with the baubles of a dying world. No wonder Christ exhorted us to watch and pray. Heaven is our home; our happy home. We are but strangers and pilgrims here. Try and realize it. Let us keep ourselves ready to enter with Him to the marriage supper of the Lamb. In a little while, and we shall see Him, not as the 'Man of sorrows,' but the 'King in His beauty.' Then let us fight against earth and all its false attractions, for it passes away. God is my Shepherd, and all my concerns are in His hands. Blessed, forever blessed, be His dear and holy name, who has looked with everlasting mercy on such a poor, vile sinner as me; and encouraged me with such sweet manifestations of His love, to trust my soul and all my interests in His hands! The world and its 'nothings' are often a sad snare to God's saints. Oh that by faith we may overcome it all, and keep close to Jesus! We are not of the world. Let us try and not attend to its gewgaws! Keep a more steadfast, unwavering eye upon Christ. He has gone a little before us, and stands beckoning us to follow. Live for eternity! Let go your hold upon the world! Receive this exhortation from an aged pilgrim, who, as she nears the solemn scenes of eternity, and more realizes the inexpressible joys that await us there, is anxious that all the believers who are traveling the same road might have their hearts and minds more disentangled from earth and earthly things, and themselves unreservedly given to Christ. Let us aim in all things to follow Him who, despising this world's show, left us an example how we should walk. Have your lamp trimmed and brightly burning, for every day and every hour brings us nearer and nearer to our home! "Dearest Jesus! help Your pilgrims to live more like pilgrims, above a poor dying world, and more in full view of the glory that awaits them when they shall see You face to face!"